This week we begin a new liturgical year, the year of Luke, and at the same time we enter into the rich and ancient season of Advent. For most Australians, Advent passes virtually unnoticed, as the celebration of what has become the very commercial feast of Christmas dominates everyone’s thinking and time. Yet taking time to immerse ourselves in Advent offers us an opportunity to dive deeply into a counter-cultural time of quiet reflection, a space of hopeful waiting and discernment. Advent reminds us that the incarnation has real meaning and that God continues to be at work in our world today. ‘Hopeful waiting’ should be a key feature of our prayer life: we bring our needs before God, and then we wait quietly and hopefully, looking forward in expectation for God’s answers. The readings through the four weeks of this Advent season take us from an apocalyptic and cosmos-breaking in view of God, to the more intimate stories in the final weeks, where Mary is the central figure. Over these coming weeks we are being prepared to see the unpredictable and unexpected way God broke into our world – in the form of a little baby born in an occupied country to a poor mother, and to understand that God’s action in our world and in our lives today can be just as unpredictable and unexpected! 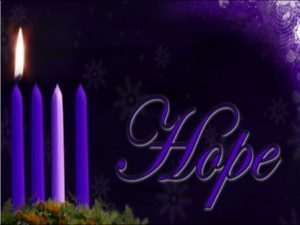 We begin this holy season with a strong call to hope and a call for a deepening of faith and love in our lives and in our communities. We begin it too, immersed in the stories of Jesus of Nazareth through Luke’s eyes. At his first public appearance in his hometown synagogue this Jesus reads from the prophet Isaiah as he publicly declares his ministry to be about freeing those who are oppressed and letting those who are blind see. Luke’s Jesus is a liberator of the oppressed, a healer, a great miracle worker, the one who raises up the weak and vulnerable and the one whose ministry is focussed on compassion and forgiveness.